1. 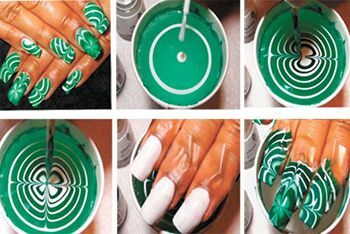 Make drops of your nail polish fall into the cup of water, one after the other. 2. Take the toothpick and slowly drag lines through the nail polish in any direction you wish. 3. After you have put on your white base coat, wrap your finger in the tape. 4. Dip as many fingers as can fit into the cup slowly, making sure that all the edges are covered. Remove the tape and use the polish remover to clean up the edges. When dry, simply apply a clear top coat and you are good to go. Lower Kingstown Park, PO Box 152, Kingstown.